If you're in search of tasty and simple slow cooker breakfast and brunch recipes, you'll love our collection, Breakfast Casserole Recipes: 5 Impossibly Easy Slow Cooker Breakfast Casseroles + Sweet Breakfast Casserole Recipes. This collection of slow cooker breakfast casserole recipes includes recipes both savory and sweet, including a French toast casserole recipe, sausage breakfast casserole recipe, and much more! Our slow cooker breakfast casseroles are perfect for a holiday brunch with family and friends. 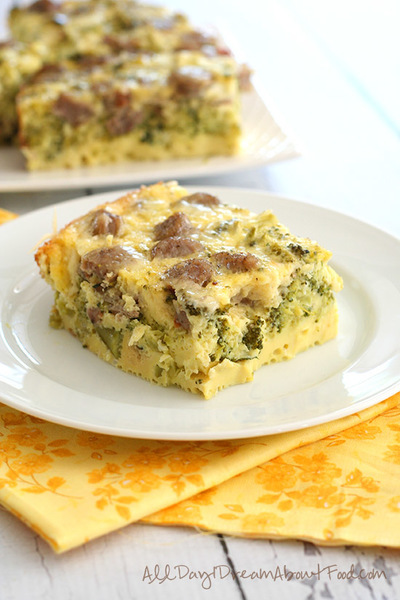 These breakfast casserole recipes are also simple enough to make for a weekend breakfast or brunch. Some of these recipes are ones you can easily make overnight, while others cook only for a few hours. Whether you want a hash brown breakfast casserole, a sausage breakfast casserole, or a sweet French toast casserole recipe, this tasty collection has some of the best breakfast casseroles you'll ever eat. If you need more great slow cooker breakfast ideas for Christmas or any time of year, try our collection, "24 Warm and Wonderful Make Ahead Breakfast Recipes For Christmas." If you're craving some hearty eats first thing in the morning, these slow cooker sausage and egg breakfast casseroles are impossibly easy. Try the always delicious, Make-Ahead Breakfast Sausage Casserole (recipe below), for a slow cooker breakfast casserole that delivers in taste and satisfaction every time. Mmm, mmm... French toast breakfast casseroles are your sweet answer to breakfast, and these amazing slow cooker breakfast casseroles recipes are among the best offerings we have. Try our favorite recipe, Apple French Toast Casserole (shown), and see why it make the perfect breakfast treat. For even more breakfast recipes you can make during the holidays or whenever you have guests, try the delicious, breakfast-worthy bread recipes in this collection: 13 Slow Cooker Breakfast Recipes Using Bread. 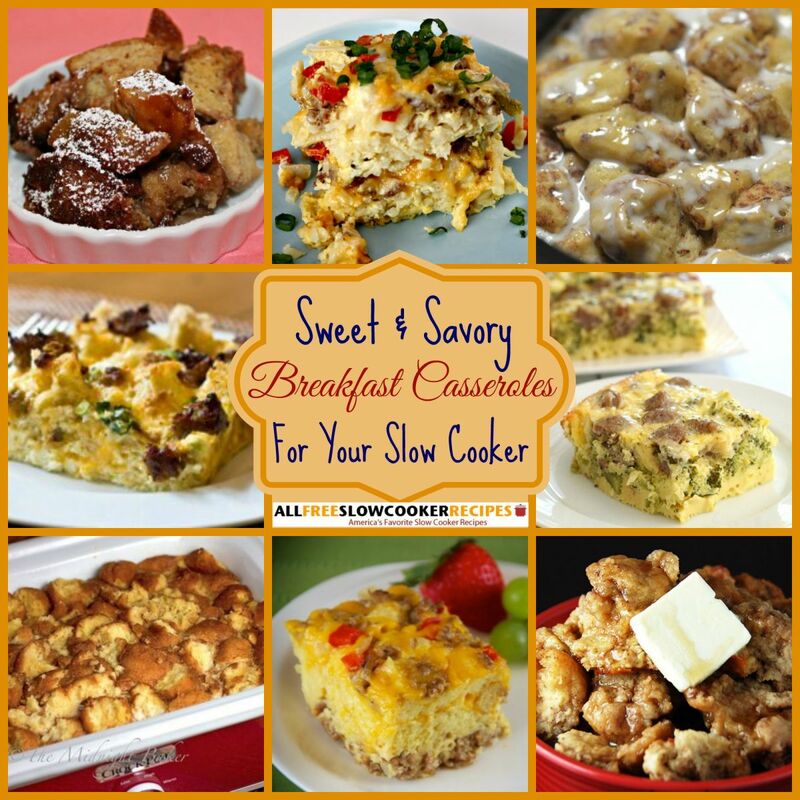 Try these other slow cooker breakfast casseroles for even more recipes ideas. Whether you're cooking a make-ahead meal for a lazy weekend morning, or a busy holiday morning, these recipes will get you through! 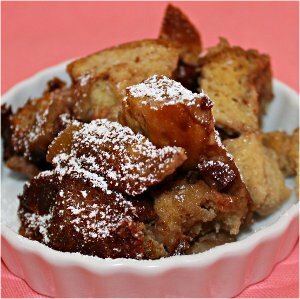 Try our Slow Cooker Donut Bread Pudding recipe (below) for a sweet spin on traditional donuts. For many of these slow cooker breakfast recipes and more, download our free eCookbook,"Mother's Day Ultimate Breakfast: 12 Mother's Day Recipes for Breakfast."